2009 is coming to an end. It was, and still is, a tumultuous year for Madagascar. The following article, which covers January to April, is the first of a three-part summary of the events that marked 2009, from the perspective of citizens who lived through the turmoil. anatin'ny indray alina. Tarataratra ho fitadiavana hanakorontanana ny firenena amin'ny alalan'ny tsy filaminana no tanjona na fanindriana ankolaka ny olona tsy hihetsika satria hanampy isa ireo olona natao hanakorontana fotsiny (A qui profite le crime?). Hisy raharaha ity volana Janoary sy ny tohiny ity izany koa! One has to suspect there had to be a mastermind behind this affair, a mastermind from outside, because the inmates could not possibly get all those “tools” in one night. Is this all about trying to disturb the public order or is it to prevent people from making a move because they will be accused of disturbing the public order ( who benefits most from the crime?). It sure will be quite an interesting month of January ! The question we are now naturally asking is the difference between the current destruction and the destruction of things in 2002?… What is the solution so that looting and destruction like these never happen again? February 7th, remembered as “Red Saturday”, claimed the lives of at least 80 protesters, among them Ando Ratovonirina, a 26 year old cameraman for the television station RTA. délégation qui demanderait ensuite à la foule de se disperser. J'étais trop loin pour savoir ce qui s'est passé dans la foule peu avant que le cordon de sécurité ne lâche. Si un responsable du mouvement a laissé entendre qu'on pouvait “y aller”, sa responsabilité est énorme. It should be noted that the HAT (transitional government) promised a thorough investigation of the events that resulted in several deaths on January 26th and February 7th. To date, however, no official reports or conclusions have been made public, adding confusion to the contradicting testimonies from different sides. It’s no longer safe to talk politics in public areas (buses included) because you don’t know who’s listening to you and on which side they are. A simple rumour about you can harm you or your relatives. Marc Ravalomanana, le petit laitier d’Imerikasinina, a été renié par ceux à qui il venait de remettre les pleins pouvoirs. Ils n’ont pas voulu vendre leur âme au diable. Les carottes sont cuites pour ce président qui a montré son véritable visage. A force de jouer avec le feu et les idoles, on se brûle. Ce fut vraiment le combat de la lumière et des ténèbres. Marc Ravalomanana, the little milkman from Imerikasinina, was rejected by the very ones he gave power to. They did not want to sell their soul to the devil. The deed is done for this president who showed his real face. When you play with fire and idols, you get burnt. It was truly the victory of light over darkness. Tsy resy lahatra aho amin'ny hilaminan'ny politika ao Madagasikara ao anatin'ny 2 taona farafahakeliny raha mandray fitondrana ny TGV [..] Hafa ny mitolona, ary hafa ny mitondra firenena. 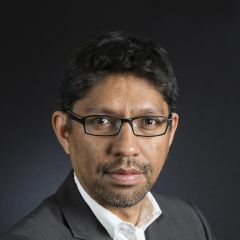 Politics will not stop erupting in Madagascar for the next 2 years if Rajoelina takes power [..] Fighting [those in] power is different from governing the country. For two or three months, I had to find money to make ends meet. It was hard as hell. The saying “You look for today what you’ll eat today” started to had a full sense to me. I was living it. I went to a uncle of mine to borrow some money and promised him I’d give it back as soon as possible. And I really wanted to keep my words but two months later, my wife was robbed in a bus with a-month-worth salary in her bag. I was hopeless, the little that I thought would help us was taken away from us. 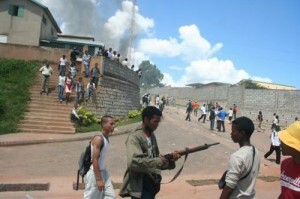 Continuing reading about 2009 in Madagascar with Mialy Andriamananjara's summary of May to November, which saw more protests, the boycott of Andry Rajoelina at the UN, the strength of Malagasy citizen media, and a devastating toxic spill. Thank you. Hope you can share with us your project when you are done :). Mampalahelo ny mijery ny vahoaka malagasy fa hatao’ny olona fitaovana hazoana toerana fotsiny!! Na iza na iza filoha malagasy, Madagascar dia Madagascar ihany na dia misy mahay miresaka oe mahavita azy aza satri famenoana paôsy no tena marina.